Made by one of the best kitchen faucet brands, the AS94ORB measures 16 ½ tall, with the spout reaching a height of 9 inches. Its hose can stretch up to 75 inches, but you connect it to an attachment to increase the hoses’ motion. With such functionality, this faucet is a perfect fit for any kitchen, new or old. The AguaStella will outlast your cleaning and filling needs – literally speaking. More specifically, this thing has undergone 500,000 cycles of rigorous testing to ensure that it is both drip-free and durable. In fact, one of its selling points is the unrivaled longevity that it has to offer. Of course, this faucet’s outstanding durability is due to the integrated sedal ceramic cartridge. There is nothing that you can’t do with this faucet. Its sprayer has all the functionality you need for every kitchen. It will spray or stream depending on the task at hand. That way, it is ideal for kitchens full of activity, or commercial settings that require frequent cleaning of dishes or filling of pots. We talked about the hose, right? Well, what you should know is that the pull-down sprayer features a 75 inches flexible hose for better maneuverability. Besides, the inside of the hose has an SPX lining to ensure that the faucet delivers a constant flow of water with no pungent smell. It may also catch your attention to know that SPX is resistant to high temperature in comparison to other materials such as EPDM. One of the most common complaints with kitchen faucets is the constant splashing around the counter. In essence, this means that you have to spend more time drying your countertop and cleaning the faucet. Well, that shouldn’t be a cause for concern with the AguaStella AS94ORB. It comes with a revolutionary function to give you an aerated stream. Also, the aerator helps reduce splash while eliminating side spray. Of course, these hoses allow you to connect your faucet to a host of attachment for increased usability. Plus, the hoses are stainless steel braided, which implies that they’re mechanically superior, complete with remarkable stability. You may also want to know that the hoses are alloy-made and don’t rust even with consistent use. To begin with, the AguaStella offers a flow rate of 2-1/5 gallons per minute. Essentially, this means that it can fill a large pot in less than a minute. On top of that, the reasonable flow rate allows you to cleanse and rinse your dishes quickly. Those who’ve used this faucet are quick to note that flow is consistent, no matter your filling or cleaning needs. The AS94ORB is incredibly beautiful. You will fall in love with the oil rubbed bronze finish. And then there is the high arch design to bring in a touch of vintage that blends blend perfectly with any kitchen, transitional or traditional. Meanwhile, the matte black finish of the hose encourages vacuum operation and effortless cleaning. Plush the outer coat doesn’t rust or discolor. Anti-Twist Protection – This faucet will remain in position for years. In other words, you can count on it to give you a robust performance time and again. In the meantime, the SPX inliner assures you of clean water for household use. Swiveling Spout – Just like the Peerless P299578LF-SS Choice Two Handle Kitchen Faucet, the AS94ORB comes with a spout that rotates all around at a 360 degrees angle. In short, this gives you complete access to your sink, thereby enabling to you clean dishes or fill your pots comfortably. 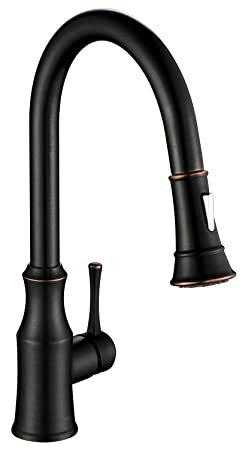 The AguaStella AS94ORB Pull Down Kitchen Sink Faucet Single Handle Oil Rubbed Bronze ticks all the boxes a good kitchen faucet should. Its performance is on point as is the cost. It makes a good choice if you’re in for a model that can handle your day to day kitchen task while maintaining steady water flow. And, as stated, this faucet thrives on durability so you can expect to last for years. Brilliant!